Do you know why it took so long for the little piggies to catch me? Because one night I stumbled into this place and I spent a few nights and the Master; he came into my room and he beat the crap out of me. And he told me that if I wanted to be a volume operation then I needed to be indiscriminate; kill anyone. Your pattern needs to be no pattern. Your pattern needs to be no pattern. Gacy sorta missed the memo that day but was fairly successful in what he set out to do, all things considered; sexually assaulting, torturing and murdering at least 33 teenage boys and young men before he was caught. His kill list would’ve been more massive had he listened to March and messed with his pattern; killing indiscriminately, without organization or method. Chaotically. When we look through the lens of philosophy, psychology and science, chaos is more than ‘disruption and disarray’—albeit worthy synonyms when used as a part of everyday language and understanding. Chaos has been formally defined by the Royal Society as stochastic behavior in a deterministic system. Brain frazzle? All it means is that chaos is random behavior (as we know) determined by causes external to the will, which can be analyzed but not predicted. The word ‘system, in this context, refers to killer clowns—who, according to the RS’s definition, do not choose the chaos they enact (it’s determined by external causes). Uh—except, surely, killers (clowns or no) make a choice to murder, mutilate or maim? It’s not like there’s some master puppeteer in the sky holding Gacy’s arm as he wields his weapon, right? Yet neither is Gacy (and other of American Horror story’s killer clowns – Twisty and Dadny) responsible for the formulation of his God-given brain nor the things that happen to him in his life. He might choose his reactions but Gacy has no control over the chemical compound of his brain, which has coalesced with circumstances to create a killer clown; a psychopathic personality. Dandy, Twisty and Gacy kill a lot – over and over – which suggests that they’re probably a bit mental; the product of some or other genetic, biological, psychological or social impairment. Psychopathologists would have a field day with these guys – figuring out why they do what they do; delving into the mechanics of their minds. Chaos, as a theory – a mode of understanding and interpreting – is particularly attractive to the field of clinical psychology because it offers insight into the why of killing. Norman P Holland (Doctor of Psychology, theorist and author) argues that it is important to recognize that the brain is a chaotic system; that small changes can have large effects. Holland’s hypothesis is also known as ‘the butterfly effect’; a name coined by chaos theory pioneer Edward Lorenz, for the idea that the flapping of a butterfly’s wings in one part of the world could create a hurricane on the opposite side of the globe. It’s an aspect of chaos theory that is easily recognizable, having been appropriated by popular culture as a thematic element in films (The Butterfly Effect, Sliding Doors, Run Lola Run) and TV. But what this means for the brain, as a chaotic system, is that reality is continuously changing and its changes perturb our mental functioning. So, basically; any life event could provoke a psychopath. However, it’s worth noting that Holland does not say that only killer clown (psychopathic) brains are a chaotic system, he just says ‘brain’ – so all brains, by implication. But not all of us are killers, which means that there must be a very specific set conditions that would create not only a killer but a killer masquerading as a clown! What psychopathologists are interested in is what makes the brain of a psychopath different from a ‘regular’ brain; that a slight shift in a parameter can send a system (a brain) over the edge, which could, for example, manifest in a killing spree. And yet if the chaotic element could be somehow minimized – the horror undermined –perhaps we would be able to look these painted villains in the face and laugh instead of cry (and kick them in the shins before they sink their serial killing claws into our feeble flesh)? This thing about pattern (the kind that got Gacy caught); when chaos theory, in science or maths, is used to analyze a deterministic system (killer clowns) it uses a bunch of crazy equations to figure out the extent of the chaos, by looking for a pattern; a sequence that can be used to explain (and even predict) behavior. Because, remember, Coulrophobia, is based on fear of the unknown. Lucretius, a Roman poet, wrote as early as 60BC that only science and philosophy can subvert our ‘childish’ fears and Lucretius was right; the real motive for discovery is to stave off our fear of the unknown by simply knowing more. We attempt to allay our fears of clowns by getting to know them better. Chaos theory attempts to find a pattern in the chaos, and in so doing render it knowable. The question is; does the brain of a psychopath conform to some sort of underlying pattern? According to Hotel’s Mr. March, the pattern is innate (“Your pattern needs to be no pattern”) and in fact, breaking the pattern requires thought and effort. That’s why Gacy was caught – his killing, chaotic by virtue of defying the norm, was sort of organized; predictable. Predictability undermines ‘unknowability’, which in turn undermines chaos and thereby chucks a spanner in the works of Horror; which cannot function effectively if its killer clowns aren’t particularly scary – by virtue of being understood. In real life, Pogo was not Gacy’s murder-persona (he raised funds for charity as an extracurricular to murder) but American Horror Story: Hotel embellishes the fable of Gacy as clownish killer when, on “Devil’s Night,” he dons the war paint that emanates from the chaos of his person (aka his clown face) and, along with his pals, partakes of pudding – dessert à la serial killer. Forget the piquant of a glorious croque-en-bouche or perfect panna cotta, there’s Stab Fest on the menu this night; murder to the soundtrack of hysterical laughter, as Gacy and the gang chortle and whoop while they make massacre. It’s the sound of psychopaths—freaks, as an antiquated, less politically correct society might say—bunched in a lump of lunacy. For the Roman poet Ovid, chaos was an unformed mass, where all the elements were jumbled up together in a “shapeless heap” – kind of like Twisty’s face; a gaping maw also personifying the meaning of the Greek chaos, defined as “yawning” or “gap.” Twisty’s botched suicide – the one that turns his face into a shapeless chasm – seems to be the straw that broke the camel’s back, initiating a shift in parameter that sends the system (Twisty’s brain) over the edge. Something changes in Twisty – something twists post almost-suicide…but there’s more to the story. Twisty was dropped on his head as a baby. The physical damage to the brain resulting from such an injury could be a proximate cause of psychopathic behavior and is used in American Horror Story as insight into the chaos exuded by its clownish fiend. Yet when it comes to chaos theory, it’s not just the proximate cause that explains behavior; complex systems (the brain, in this instance) are extremely sensitive to interactions with other complex systems –other people, weather, the ecosystem, cities, climate, living cells and ultimately the entire universe. American Horror Story: Freak Show doesn’t give us all the variables but it does offer some. For one, Twisty was bullied. He was the special children’s clown to Rusty Westchester’s Traveling Carnival. Twisty, always depicted in costume, is the epitome of a clown; escaping his awkwardness by making it an acceptable part of his persona, as children’s entertainer. We’re told that he loved the children and made them laugh but the freaks, jealous of his popularity among his audience, called him “simpleton” and tricked him into believing that the police were after him for child molestation (“Freak Show: Edward Mordrake, Part 2”). Rejected by the townsfolk, who labeled him a pervert and molester, Twisty is forced to flee. So affected is the clown by this interaction with other complex systems that he tries to kill himself but fails, only destroying his face. The only time Twisty is shown without his clown costume is when he attempts suicide; his torment and despair exposed rather than hidden behind the mask. Exuding helpless resignation, Twisty says; “I can’t even kill myself” (“Freak Show: Edward Mordrake, Part 2”). After this failure his clown costume deteriorates and his mobile home is a picture of atrophy, an outward representation of a dilapidated mind. Twisty metes out bloodbath after bloodbath, his acts of violence immortalized in the Jupiter town newspaper: “Farmhouse murder shocks Jupiter,” “hunt for killer heats up,” “Parents murdered, boy missing”. These murders are bloody and gruesome – horrific; and yet when we acknowledge that they are the likely result of causes outside of Twisty’s control, the monstrousness is somewhat crippled. The killing sort of makes sense. Chaos theory refers to the determinability of chaos; that Twisty’s killing is a predictable result of a combination of unpredictable variables. It couldn’t be predicted that he’d be dropped on his head and bullied into a state of suicide; that his momma would die and that when he’d try to kill himself he’d mess it up, but the effect of such trauma on the brain could easily flip the killer switch, as psychologists might argue. Even Twisty’s victims are predictable. He talks about saving the children from the evil freaks—their mean parents. He says, “I gave ‘em candy and they didn’t have to do chores” (“Freak Show: Edward Mordrake, Part 2”). He becomes obsessed with making children happy and kidnaps children for an audience; offering his captors tricks, toys and a decapitated head (Mr. Hanley from the toy store) as entertainment. 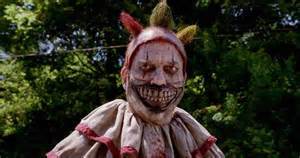 There is a pattern to his killing, which makes him knowable; we are able to explain Twisty’s ruthlessness and perhaps even have empathy for the poor clown. The ghostly Edward Mordrake says of Twisty, “I have met many a craven killer, many a sniveling coward in my time, but every one of them could admit the blackness in their own hearts when the hour came. You have caused the demon to weep” (“Freak Show: Edward Mordrake, Part 2”). Mordrake kills Twisty, choosing him, a true (honest) freak, to join his spirit troupe in the afterlife. While the demon is weeping and the mystery behind Twisty is being demystified, Dandy is perpetuating his own brand of chaos. Obsessed with Twisty, Dandy goes trick or treating dressed in a homemade Twisty costume. After attempting to kill his maid Dora and backing off after she calls him out, he visits Twisty’s trailer and torments the captives. Dandy helps Twisty retrieve a runaway and the two clowns decide to stage “the greatest show on earth,” which is rudely (and fortuitously) interrupted by Edward Mordrake. Twisty is taken off to discarnate Carnieland and Dandy becomes the new Twisty. Wearing Twisty’s mask, he manages to kill Dora and then smiles and laughs (a nod to Gacy’s psychopathic tune). Dandy also kills Andy in the back of Twisty’s bus; wearing Twisty’s mask as if it were some sort of talisman. You think I’m defective, unbalanced, fragile. Well if I am unbalanced it’s your fault. Dora told me everything when I was 5. Your father was wiped out by the crash of ’29 and you’d have done anything to get back to a home like this; even marrying your second cousin. I was born in deadly sin. You knew what father had done to those little girls and you knew the risk of breeding with your cousin. The insinuation is that Dandy was born a little cray as the result of incompatible gene mixing (inbreeding). Chaos theory suggests that small changes that are external to the brain can result in very large changes in experience; that an individual’s reaction depends on the initial conditions the brain brings to those changes in reality. In mathematics, the ‘initial condition’ is any of a set of starting-point values belonging to or imposed upon the variables in an equation that has one or more arbitrary constants. Blah blah what? OK, so if we apply this to a brain we’re talking about the initial condition of said brain how the neurons within that brain are at the very beginning; our identity before the world gets hold of it. We bring the initial conditions of these neurons to any given change in reality. Dandy’s ‘initial condition’ was…wonky, and when juxtaposed with other influential events – like rubbish parenting, for example – reveals psycho-Dandy, killer clown; chaos personified. Dandy has always been a willful child; I often thought of him as a foreigner; a perfectly groomed aristocratic boy who played the part but didn’t quite understand the language – because words have a different meaning for him. Particularly the word ‘no’. No was an affront; a battle cry. I complained about the cat digging up my azaleas, so he killed the poor animal. I was never destined to feel love. The desert knows no mercy. Anything you try to plant out there dies. I must accept this emptiness as a blessing, not a curse. I know why I was put here, Mother. My purpose is to bring death. But I am no clown. I am perfection. I am greatness. I am the future, and the future starts tonight. Dandy has moved away from the abstruseness of clown into the realm of megalomania, calling himself a ‘God’ – from the town of Jupiter, another hint at an organized system. He may not be ‘innocent’ like Twisty, whose brain cannot fathom the immorality of its thoughts and ensuing behavior, but he is inflicted with delusions of grandeur, which surely attests to some form of insanity. And yet even so, his killing is not random; an insecure child devoid of love, Dandy kills in an effort to feel superior, to quell the deep sense of inferiority rooted in his childhood. Jimmy says to Dandy “I know exactly who you are! You were behind that mask; you’re the other clown! You’re a murderer” (”Freak Show: Magical Thinking”). German philosopher Max Horkheimer and his compatriot Theodor Adorno stated: “Humans believe themselves free of fear when there is no longer anything unknown.” Knowing Dandy, understanding why he does things, might make him less horrific…but not entirely. He’s still a killer. He kills his own mother; a bullet to the brain. And the freaking Tupperware party massacre – omg! Although some of the horror is undermined by the imposition of order upon the face of American Horror Story’s chaotic killer clowns, whilst complex systems might act according to pattern, they are not predictable. We might be able to profile a likely victim – as with both Twisty and Dandy – but the reality is that anything could happen. The elemental chaotic nature of ‘clown’ persists through any understanding attained through the application of chaos theory, and so the fact remains; clowns are scary…killer clowns are astronomically scary. Andrea Zanin is the author of pop-culture blog Rantchick.com. She lives in London, where she spends her time writing, ranting, and being a journalist. See more of Andrea’s work in Sons of Anarchy and Philosophy, Hannibal Lecter and Philosophy, Jane Austen and Philosophy, Alien, Wonder Woman and Philosophy, X Files and Philosophy, and The Americans and Philosophy.